With the arrival of Audio-Technica’s new turntable, its top-of-the-line AT-LP7, I’m back in my comfort zone, happy to have a new record player in my listening room, especially one that looks as nice as the LP7 does. It may be considered Audio-Technica’s top of the line, but at $799 it’s still well within my entry-level guidelines. There’s a surprising amount of competition right now in the sub-$1000 turntable market, with solid decks from Music Hall, Rega, Pro-Ject, U-Turn, and others. They all more or less have the same basic layout: rigid plinth typically made of MDF or some other non-resonant material, two basic speeds, a non-resonant platter of acrylic or some other type of plastic, and a pre-mounted tonearm with no real ability to easily swap out new tonearms. That definitely describes the LP7, but it’s not a bad thing. This basic design is more or less universal at this price point for a reason: It’s simple and it’s effective. It allows people who maybe aren’t too into the fiddly-ness that naturally comes with vinyl playback to experience a more advanced turntable. The LP7 even has a built-in phonostage (that can be bypassed) for those who don’t have electronics with a phono preamp. It’s a compromise between form, function, and user ability. The LP7 is a step up from your entry-level turntables, both in cost and in functionality, and I was really interested to find out how it sounded. 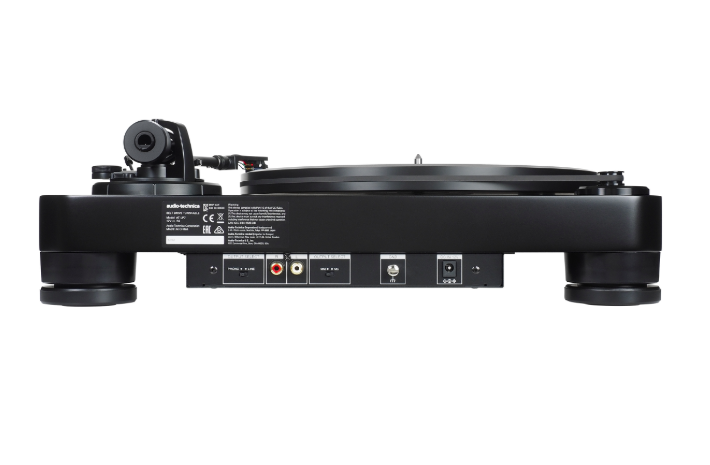 The LP7 has a thick black slab for a plinth with a black platter, round black feet, and a black J-shaped tonearm. The dustcover is even tinted blackish gray. It’s a very attractive-looking unit, very modern, with no faux-wood trim. I love that it comes with a lift-off dustcover, which is the best kind; it fits beautifully and is also nice and light. The feet are a little springy, which I think will help with vibration, the bane of any serious deck. Plus, the feet are easily adjusted for perfect leveling. The LP7 is a fully manual, belt-driven ’table—no auto-lift and shutoff at the end and no fine-tuning of speed, though conveniently there is an electronic switch for 33 or 45rpm. Using a strobe with my Android phone running the RPM Calculator app, I found that the LP7 maintained speed pretty well; it was just a touch fast. The LP7 is fitted with the VM520EB cartridge that retails for $119 and is one of A-T’s more affordable models. It’s factory mounted, so you won’t have to deal with tiny screws, which is always nice. The tonearm also has a standard headshell mount for easy cartridge swapping, which I love, along with an adjustable tracking-force knob, anti-skate control, and the ability to change ’arm height.